For brides-to-be, finding perfect wedding veil designs that complement their dresses demands a little bit of patience and research. So, what veil length is best suited for a short wedding dress? For an informal wedding, should the bride wear a veil with lace applique or just a simple blusher bridal veil? And what are the different styles and lengths of wedding veils available? 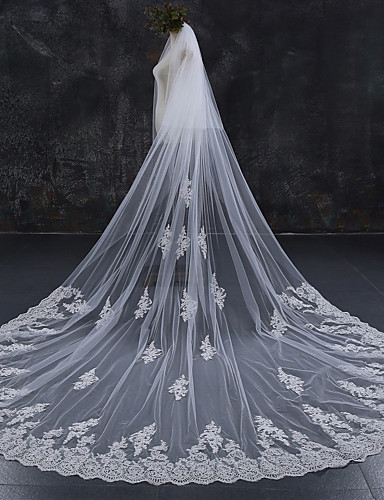 Beautiful wedding veil design - 1 tier Cathedral veil made from lace tulle fabric in ivory colour. They are simple, yet stylish and cute. 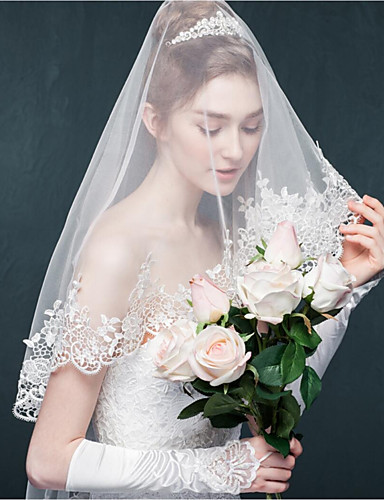 Blusher wedding veils are made to cover the eyes and extend down well below-the-chin and are a perfect match with sleeveless high-neck wedding gowns. A blusher veil with lace and sparkling glitter applique edge. Shoulder veils extend down to the shoulder and measure between 18 and 20 inches long. They are considered informal and work best with knee-length or midi-length classic wedding dresses. These veil types extend down to the elbow area. Elbow veils measure between 24 and 26 inches, depending on the height of the bride-to-be and whether she has long or short arms. They are perfectly suited for ball-gown dress style and end where the fullness in the skirt begins. They are also great for a full-skirted informal dress without ‘overwhelming’ the entire ensemble. 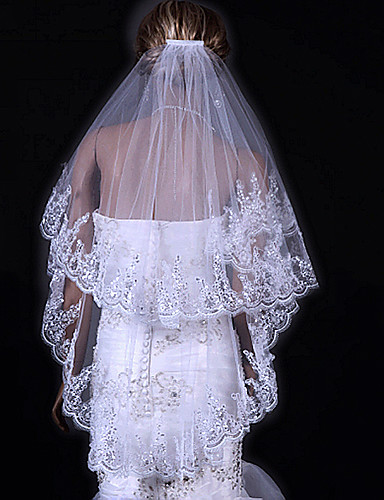 The fingertip veil is one of the popular choices of wedding veils. It extends down to the fingertips and measures around 36 inches. This style of bridal veils will work perfectly for most dress styles, as long as it’s around ankle-length. Chapel veils fall down onto the floor and are about 90 inches long. Though they sweep the floor lightly, they are shorter than the Cathedral Veil. 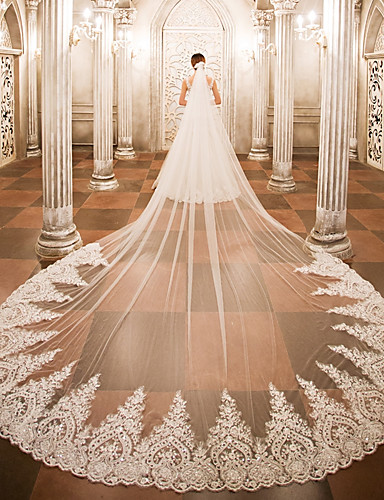 The chapel veil is best worn with classic style bridal gowns with long trains. The Cathedral veil is by far the most formal of all wedding veils. It is the longest type, measuring anything from around 100 inches long to up to 120 inches and are meant to ‘sweep’ the ground way behind the bride. The Cathedral wedding veil works best with full length, classic style gowns. 2-tier white Cathedral bridal veil with lace applique on its edge and body. A veil will never look complete without an edging or special trim. Whether plain and simple or stylishly vintage-inspired, the edging of bridal headpieces can make or mar the style of a veil. Exceptional fabrics for wedding veil designs include the following and are the basic materials used to create wedding veils. Chiffon - Chiffon veils are best made as single tier veils because it is weightier than tulle based fabrics. It is non-translucent, fluid, and soft-flowing. Organza – This fabric is high-end and is a popular choice for top bridal gown designers. Organza is elegant, slightly stiff, and semi-translucent. Silk tulle – Bridal headpieces made with silk tulle drapes down elegantly. It is a beautiful fabric but is not commonly used for making wedding veils because of its delicate nature. It is made of pure silk, available in several textures, and is virtually the most expensive veil. Illusion tulle - This is the most commonly used fabric for most wedding veils and is made of 100% nylon of varying textures. Bridal illusion tulle is soft to the touch and is available in a good number of colours. English net – This fabric is a favourite of many brides-to-be. It is made of polyester nylon, has a very soft texture and is transparent. Best made into single-tiered bridal veils, English net drapes down in a similar way to chiffon, but weightier because of its polyester blend. Point D’Esprit – This material is patterned yet translucent with or without a criss-cross dotted pattern. It is a popular veil fabric for brides who desire a lace ornate wedding dress. Swiss Dot – Veils made using Swiss dot fabric have become increasingly popular. The fabric is made of bridal illusion and features small felt dots throughout the fabric. The colour of your veil will be majorly determined by the colour of your wedding dress. Colours of choice are white, ivory, and champagne. However, depending on the theme of the wedding, some brides opt for silver, black, and red. For instance, black or red veils are the perfect colour choices for Gothic themed weddings. 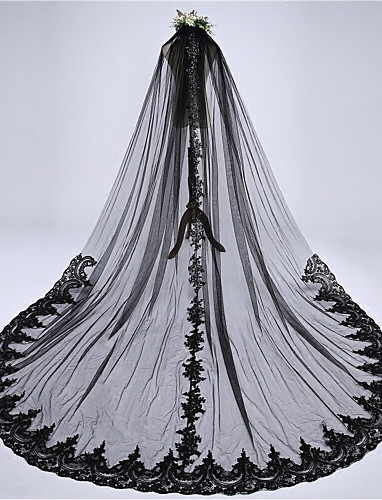 Black wedding veil design for the Medieval style inspired bride-to-be. To make the right choice of wedding veil designs, it helps if you understand all the different styles, fabrics, and designs available out there. So, whether you are a younger bride or older bride, knowing the differences before choosing a veil for your special day gives a much better idea on how to get a bridal veil style that works best for your dress.